If Clever lived in the American Southeast rather than South America, he would probably be called white trash. The socially awkward martial arts instructor has a fondness for Bruce Lee, video games, booze, drugs, and custom flaming paint jobs on muscle cars. 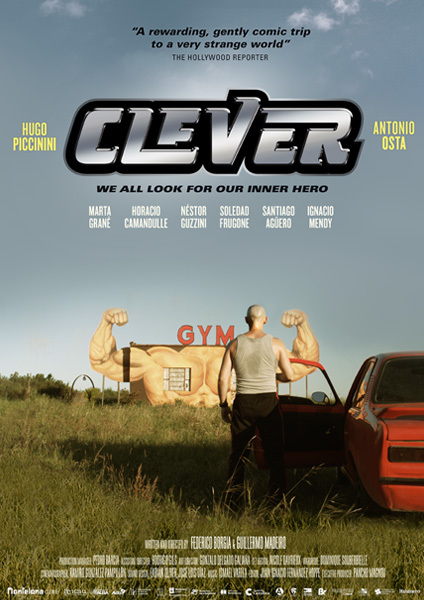 His 1976 Chevette Shark doesn’t really qualify, but he still intends to get it pimped out accordingly in co-director-screenwriters Federico Borgia & Guillermo Madeiro’s Clever (trailer here), which screens during this year’s AFI Latin American Film Festival. Clever does not have much going on. His ex-wife Jacqueline has moved onto to a more responsible Fiat driver after divorcing him, but he still wallows in denial. His husky son Bruce (named after you know who) has not taken after the old man, despite all the time he has spent in his father’s dojo. Hoping to bond with his son and maybe finally taste a bit of glory, Clever intends to get his Chevy decked out for the upcoming car show. However, the mysterious artist whose work he covets has relocated to a provincial burg. After chasing down several false leads, Clever finally tracks down Sebastian, a Momma’s Boy bodybuilder who might just be the Rembrandt of muscle cars. He has an artistic temperament but his ambiguous sexuality makes Clever uneasy, but nowhere near as uncomfortable as the manipulative mother’s come-ons. With its garish title design, Clever tips its hat towards exploitation films, but then delivers a critical meditation on masculinity that is clearly skeptical regarding its merits. It is a quiet film, but it still metes out quite a bit of humiliation. Tonally, Borgia & Guillermo try to be half-pregnant, splitting the difference between quirky and contemptuous. It is a fraught line they walk. 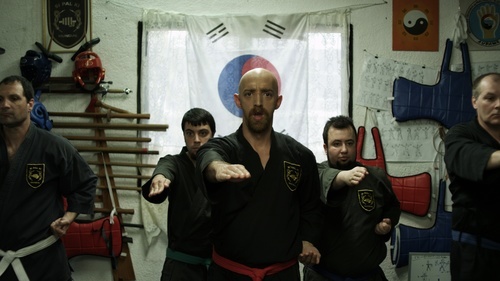 Still, they could hardly ask any more of their lead, Hugo Piccinini, who has the perfect muscular nebbishness for the alienated martial arts sensei. Frankly, it is compelling to watch him try a navigate his way through a world too complex for his fists, but in a decidedly sad sort of way. Despite the strange sensitivity of Piccinini’s performance, Clever is a rather unsatisfying meal. Borgia & Guillermo are too content to coast on their presumed eccentricity, leaving the film mired in its wet noodle pacing. It is hardly an affront to anyone or anything, but there are better films to invest your time in. Just a mediocrity, Clever screens tomorrow (9/25) and next Thursday (9/29) as part of AFI’s annual Latin American Film Festival, just off the Beltway in Montgomery County.